Singletracks members earn points for sharing photos, videos, and reviews of mountain bike trails and gear. Our mission is to build and share the most comprehensive database of mountain bike information online and your photos and reviews will ultimately help fellow mountain bikers find the best places to ride and the best gear to buy! To get started, sign up for a free account and start adding photos, videos, reviews, and maps. Once you earn 30 points you'll unlock unlimited access to thousands of premium topo maps! Yes! Your account dashboard features a progress bar showing how many qualifying points you've earned. Yes. The editors at Singletracks.com reserve the right to remove any content we feel isn't helpful to other mountain bikers. In the event a photo/review/video is removed, you will not receive points for that submission. You'll need to earn 30 points initially to join the Singletracks co-op. From the time you earn 30 points, you'll have access to all features for a full year. Co-op access operates on a rolling basis so as long as you've earned 30 points within the last year, you'll continue to have access. For example: you earn 30 points on January 1, 2013. Your co-op access is set to expire on January 1, 2014 but you earn 15 more points on June 1, 2013 and another 15 points on August 1. This extends your co-op access to June 2014. If that sounds confusing, not to worry. You can always view the expiration date of your co-op membership in your member dashboard. What's so good about the Singletracks topo maps and why would I want to earn access? Our topo maps utilize premium data from NeoTreks + AccuTerra and include more than 250,000 miles of trails within the US. Outside the US we rely on topographic and trail data from the OpenStreetMap and OpenCycle projects. You can also view topographic map layers from the USGS. Each topo map is printable and downloadable in PDF format. Maps are organized around the thousands of MTB trails featured on Singletracks.com, making our topo maps an excellent planning tool for your next adventure. Singletracks also features downloadable GPS data, elevation profiles, and trail overlays for most trails in the catalog. 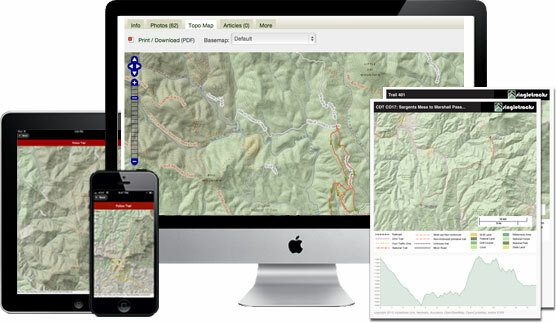 Topo maps are available online AND in the free versions of our smartphone apps for co-op members.